A serious dent substantially reduced the internal diameter of a customer’s pipeline at one spot. As a main supply line for the area, the pipeline is crucial, and the operator really wanted to know: is it still safe for humans and the environment to operate the pipeline, and, not less interesting, is the pipeline piggable with this dent? The ROSEN Group said, “Yes, it is.” But validating this statement would include a risk assessment, repair proposal, maintenance cleaning, aggressive cleaning before inspection and an in-line inspection (ILI). For this, ROSEN designed and built a perfect replica of the dent and executed several pull tests at its base in Lingen (Ems), Germany. After locating the dent and doing the risk assessment, a repair plan was initiated. However, although repair work was possible, standard repair methods would not do the trick. Therefore, ROSEN experts proposed to cover and support the dent with a custom-designed pressure-containing sleeve that would provide a robust permanent fix. After creating a solution, a third-party supplier executed the repair work. This way, the operator could continue to operate safely. Impressions of manufacturing the dent replica. They simulated it – now build it! Despite positive simulations, gaining confidence in a new development is always difficult. Not wanting to take on too much risk and to further validate the cleaning tool’s setup, a more physical simulation was required, and that came in the shape of a pull test. Utilizing 3D laser scan data, experts developed a perfect replica of the dent. “We ordered more than one hundred single metal sheets to recreate the dent in our Factory. We then finished them up in our welding shop,” explained Jörg Uhländer, executive vice president of ROSEN in Lingen (Ems). 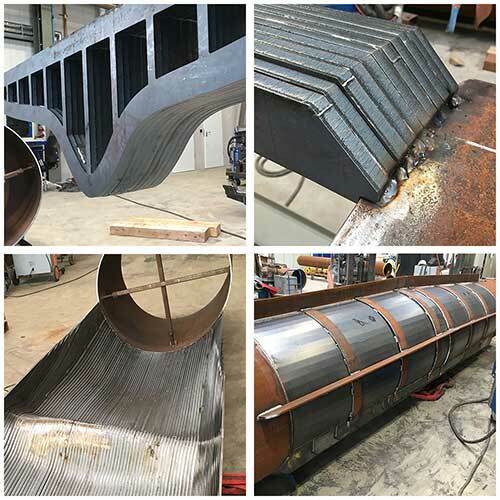 The welding experts placed the sheets between two pipe sections and welded everything together with painstaking precision work. They then ground off the sharp edges and made the pipe watertight – for potential pump tests to follow. The pull tests took place in the 30,000 m² ROSEN test area in Germany. “We were quite sure that it would work well, but of course we felt a bit tense,” said Willi Voß. At a speed of half a meter per second, the cleaning tool had to pass the dent — and it made it. After proving its skills on the test field, the maintenance cleaning tool had to cope with the real dent. And lo and behold, field service technicians successfully executed the run, and the tool passed the dent, even collecting more than 200 kilos of wax out of the pipeline. This was how the pipeline was kept running. After having gained significant knowledge and information from the development of the cleaning tool, the ILI is to follow. Together with the operator, research and development teams, manufacturing capabilities, and of course the resources available in terms of testing, the challenging task will be faced with all forces aligned. The goal of the inspection will be to identify any metal loss, other dents, bending strain and pipe movement. Register now if you would like to see more stories like this and receive the latest news and updates. read on Not yet registered?